Bill’s Gambling Hall & Saloon, formerly Barbary Coast, is getting cleaned up and rebranded by Harrah’s or maybe even another company. I’m (Robin Leach) hearing exclusively from very reliable sources that the 4.3-acre property is part of a staggering deal with a major nightlife entertainment force, and everything including the 17,200-square-foot casino will get a major overhaul from top to bottom. When the news is officially announced, it will rock the nightlife scene. Bills/Barbary Coast has never gotten my interest. In fact, the only time anyone mentions this place is because of Drai’s. A makeover to fit that crowd might make a lot of sense. Since there isn’t a hotel component, I can see Bills being changed into a building with multiple clubs and gambling. **UPDATE: Thanks for the heads up that there are actually hotel rooms at Bill’s. I’ve never been, but now I know better. 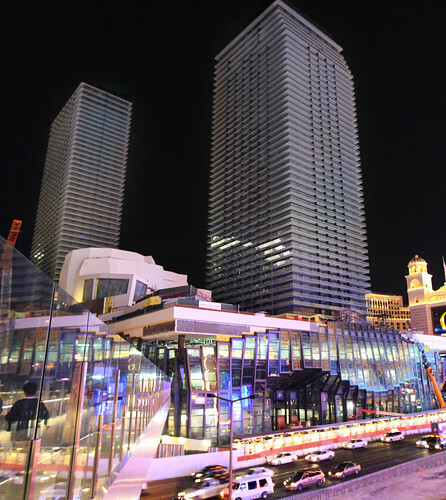 There has been a lot of excitement with the Cosmopolitan starting their grand opening marketing campaign. I love what’s going on and instead of multiple posts about it I’ll share what I’ve found online in the past week. Cosmopolitan website launches. Looks good. Not much about the casino though. Vegas Tripping has an opinion. Of course. Steve Friess from The Strip Podcast (which is awesome) shows why the Cosmo flash site isn’t good for those of us with macs or ipads or iphones. The Cosmo has a flickr page with some nice pictures. West Vegas has a slew of pictures of the Cosmo. The touch ups make some look like paintings, but that’s kind of cool. MSNBC sees the site and reports that reservations are now being taken. So does the Las Vegas Sun but they have more info. Vegas Tripping looks at the rooms. NOT into a window view of the toilet. Way too hip for me. Stiffs and Georges shows that there may be a little doubt that The Cosmo will succeed. It’s nice to see a different opinion. It’s too early to tell if this is on point, but I think it may be close. Vegas Chatter also looks at the rooms. Again no toilet talk. I had to comment. New pictures of Cosmo pool area at Vegas Today and Tomorrow. Here are some other ECG blogs on the Cosmo. Rumor: Mandalay Bay and Las Vegas Hilton For Sale? Robin Leach has been on fire with somewhat interesting rumors this past week. One of his quick hits this week is that Mandalay Bay and Las Vegas Hilton may have new owners soon. There seems to be a few investors looking to get into Las Vegas casinos with properties being available at bottom dollar. Investor John Paulson has been the most recent money man getting in on the action, purchasing almost 10% of Harrah’s. This is only rumor and it’s from Robin Leach, so I’m not going spend much thought on what the future may hold for the properties. I wonder who else is sniffing around. 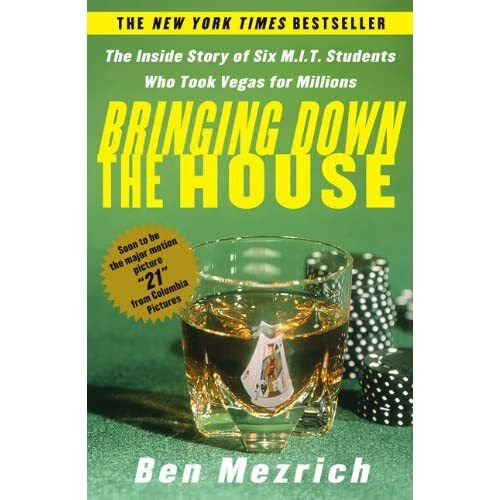 Jeff Ma wrote the awesome book Bringing Down The House with Ben Mezrich. Looking at him, you may remember his cameo in 21. Besides being a card counter for the MIT blackjack team Jeff has also been a part of fantasy sports (he used to appear on the MLB fantasy podcast) and got into sports in general. This interview, from tech crunch, touches on his new book in addition to blackjack, sports and movies. It’s a nice view/listen. Enjoy. 6-5 Blackjack is “Great” For Tourists!? I don’t know how this one slipped past me until today, but the headline says it all. ..6-5 games are “great” for tourists.. The exact quote is “The 6-5 games are “great” for tourists getting a feel for blackjack, Rubin says.” Rubin is “Max Rubin, a casino consultant and gambling book author.” It’s this attitude that angers people that pay attention to pay tables and such. There is lots of great fodder in the article for me to spew anger at, but even in context there’s no way anyone can justify that 6/5 blackjack is better for the player than 3/2. Like all casino games you just look for the slowest bleed and odds to maybe win a little. 6/5 blackjack speeds up the losses. Animal psyche will run away if it endures too much pain too quickly. Less people gambling less lead to $1 billion less in blackjack take for the Vegas casinos. Time for the casinos to slow do the lust for money and get consultants that don’t look down on their core consumers. This morning Vegas Tripping has an article that touches on a similar topic. As usual, a good read on VT. Registration isn’t over for all events at the World Series of Poker (WSOP) yet, but the total number of entries is already 20% more than last year. Official statistics from the 41st World Series of Poker currently running at the Rio in Las Vegas indicate that through the first 56 events, there have been 65,647 entries, surpassing last year’s total entries including the main event of 60,875. And this year’s main event registration numbers have yet to be recorded! I thought interest in casino poker might be slowing last year with the 8% drop in TV ratings. Maybe, I was wrong. It can happen. Maybe people still have dreams of a dollar and a chip.